Have an abundance of tomatoes right now? My CSA sent me home with 10 pounds of tomatoes, and the only thing to do, aside from tomato & mozzarella salads, is to make a big ‘ol batch of sauce! 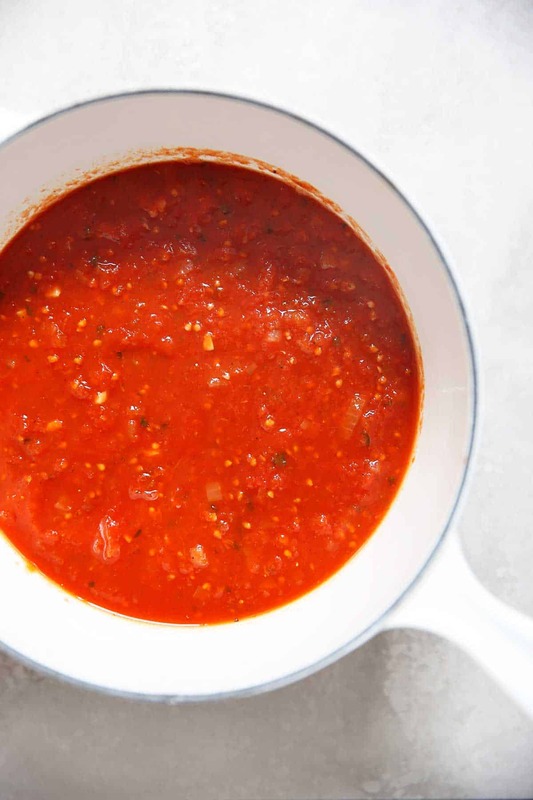 This Freezer Friendly Tomato Sauce is a labor of love, but so so worth it! The perfect way to make use of all of these fresh tomatoes during tomato season! This time of year is one of my favorites. Tomatoes on EVERYTHING. A few years ago I visited tomato farms and really gained an appreciation for them. So many variations, so many flavor profiles. I can eat the little grape tomatoes like candy, no joke. Plus, they are gorgeous, too! 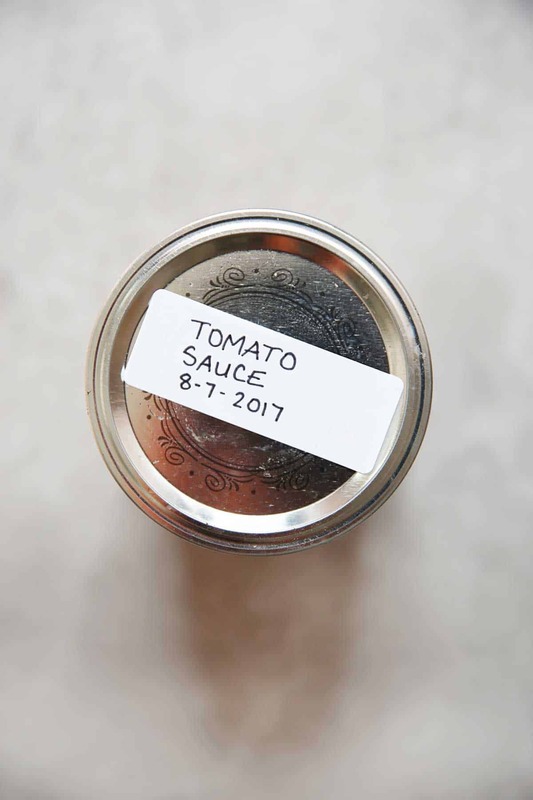 When you get 10-15 pounds of tomatoes, two things happen: 1. you eat all the salads and 2. if you don’t muster up the energy to make a sauce, you’re likely to waste said tomatoes (they’ll eventually get soft and blah). SO, while it’s a little bit of a process, it’s for sure worth it. It’ll be some of the best tomato sauce you’ve ever had. 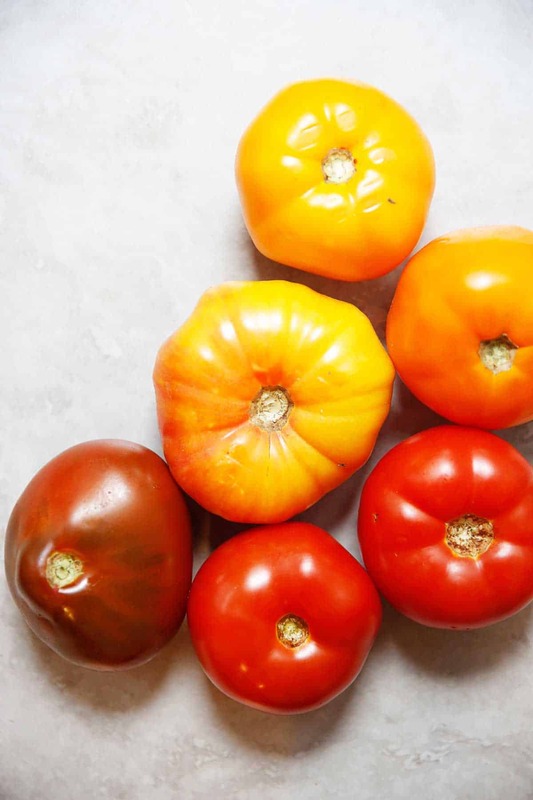 Plus, you’ll feel good knowing you didn’t waste those farm fresh tomatoes! Can it if you’d like, or if you’re lazy like me… go for the freezer option! Optional: 1 tablespoon lemon juice, 1/4 cup lemon juice if canning! Fill a large pot with water and bring to a boil over high heat. Working in batches, drop the tomatoes in the water for 1 minute. Carefully take tomatoes out and place in a large bowl. Let tomatoes cool. Once cool, carefully peel off skins. Core the tomatoes and place in a food processor or blender. Puree until smooth, or pulse until desired consistency is reached if you want a chunkier sauce. Set aside. In a large pot, heat extra-virgin olive oil over medium-high heat. Add onions and garlic. Sauté until onions are translucent. Add in dried basil, dried oregano, salt, and pepper. Stir for 30 seconds, just until fragrant. Pour in tomato puree and stir well. Bring the mixture to a simmer and let cook for 2 hours, or until thickened and reduced. Add lemon juice if using. Taste and adjust seasoning as desired. Take sauce off heat and cool down to room temperature. Pour into freezer friendly plastic containers and freezer! 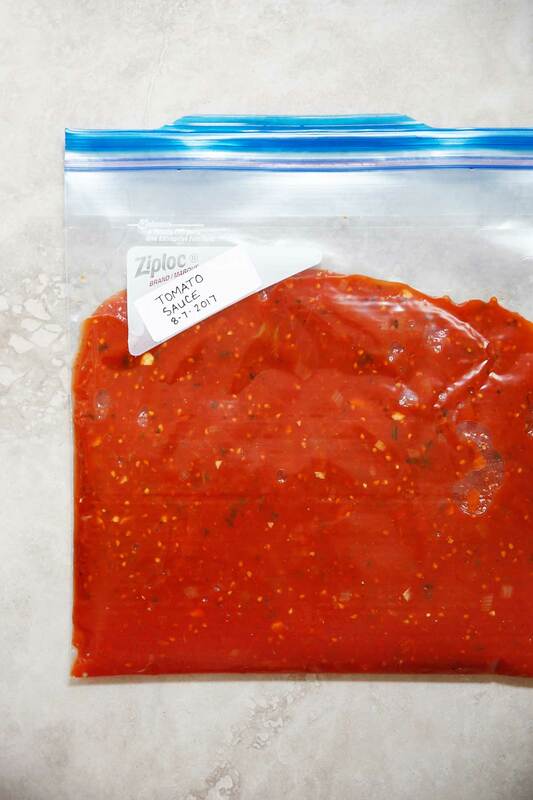 *Tomato sauce will last in the freezer for 4-6 months. 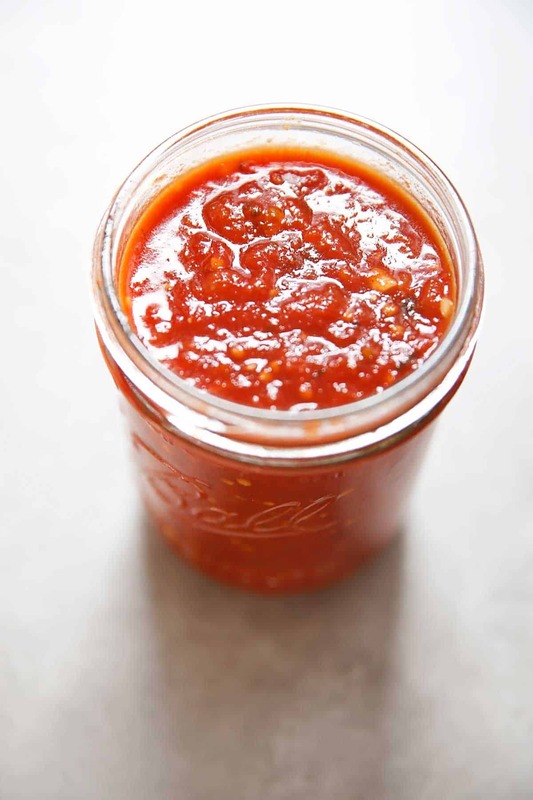 *Feel free to can this tomato sauce instead of freezing it! If you do so, make sure to take out the extra-virgin olive oil from this recipe. Oil is known to higher the probability of potential strains of botulism when canning. Also, make sure to up the amount of lemon juice to 1/4 cup! The lemon juice will increase the acidity in this sauce to safe levels for canning. Place all ingredients into a large saucepan. Bring to a boil over medium-high heat. Lower heat to medium-low and simmer until thick. Taste and adjust seasoning as needed! Let cool. Pour into sterilized canning jars and twist on sterilized lids until very secure. Place jars in a pot of boiling water for 30 minutes. Let cool completely on the counter. Make sure that the lids have sealed completely. If the lid pops up when pressed, the canning process did not work properly. Store in your pantry for up to one year!